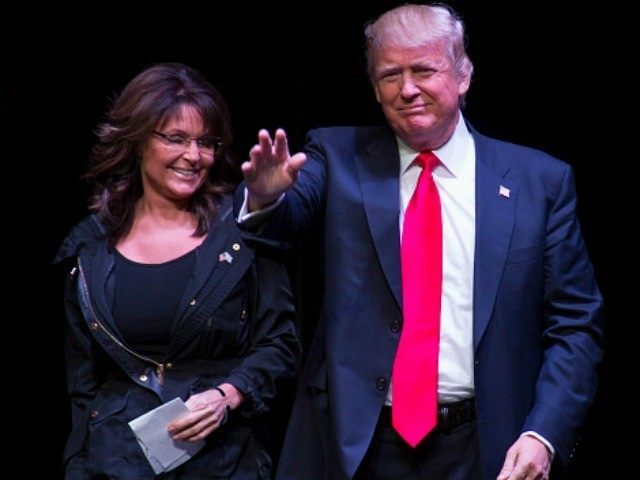 Donald Trump is sending Sarah Palin, one of his best political surrogates, to the Wyoming Republican State Convention, in an effort to woo delegates to his campaign. On Saturday, Wyoming State Delegates will select the remaining 14 delegates to represent the party in Cleveland. Twelve delegates were already selected at party’s county caucuses in March. Three other delegate slots go to the party’s national committeeman, national committeewoman, and the chairman of the Wyoming’s Republican Party. Trump is anxious to stop the flow of delegates to his rival Sen. Ted Cruz. In Colorado, Cruz swept all 34 delegates in the state awarded by congressional district meetings last week. Cruz, however, begins the Wyoming campaign for delegates already ahead. In March, Cruz earned nine delegates while Sen. Marco Rubio and Donald Trump only earned one delegate each. The Texas Senator has already traveled for two campaign events in Wyoming, making it clear that he wanted to compete in the state. Cruz is expected to speak for himself at the convention while Idaho Gov. Butch Otter will speak for John Kasich. The race for delegates places an unusual spotlight on the state’s electoral process as each candidate fights for an delegate advantage. But while the absence of a Republican primary in Colorado is fairly new, Wyoming’s Republican party has maintained their delegate selection process for decades. In an interview with Breitbart News, Wyoming Republican chairman Matt Micheli defended the process, noting that the state had followed the same primary process for presidential nominees since 1974. According to State Party by-laws, delegates can inform the state convention of the candidate they plan to support, or identify as an unbound delegate. The group of 505 state delegates will participate in the selection process. The process was slightly altered to remove an unbinding straw poll, he explained, a 2012 experiment that was ultimately rejected by the party. “That straw poll was completely meaningless. It was not bound to anything or anybody,” Micheli said in an interview with Breitbart News. In 2012, Romney was the victor of the non-binding straw poll, but his campaign and the media chalked it up as a victory for the Republican front runner. With new focus on the Wyoming process, Micheli said party officials had discussed the details “ad nauseum” and “bent over backwards” to make sure that every candidate felt like they were being treated fairly.